Live coverage following Tuesday's earthquake in Haiti, in which tens of thousands are feared to have been killed and some three million displaced. Hopes of finding survivors in the rubble are fading and the focus is now on getting urgent aid into and around the country. 2300 The BBC is discontinuing this live update page for the night. For the latest developments, please go to our main news page. 2259 The BBC's Andy Gallagher in Port-au-Prince says: "The airport is now busier than ever. But even as the plans land, and the supplies are unloaded, there are major problems distributing the aid. Much of it remains on the runway - tents, blankets and medical supplies sitting unused. Military personnel told me the logistical complexity of working out of such a tiny airport is a major stumbling block. But the fact remains that very little aid has reached those who need it. In the city itself, I have seen the UN handing out supplies. But it is the injured and dying who require most help. Haiti has now handed over control of the airport to the US, a move that could finally speed up the relief effort." 2255 Lord Malloch Brown, the former UN deputy secretary general, tells the BBC that the rescue effort has been damaged by the loss of much of the UN team in Haiti, but that it is well-placed to recover quickly. "Obviously any organisation which so tragically has its leadership decapitated is in chaos for a bit. But in fact the UN is much bigger in Port-au-Prince than it is in most places in the world because of the big peacekeeping operation there. The UN is in a better place to regroup and recover than would be the case in many parts of the world where natural disasters strike and the UN has almost no presence. But I think the really big factor here is the proximity to the US, which is able to project by far the most capable logistics operations in crises like this," he says. 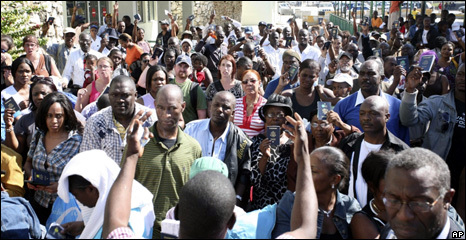 2237 US Homeland Security Secretary Janet Napolitano says undocumented Haitians in the United States will be granted "temporary protected status", which will allow those eligible to continue living and working there for the next 18 months. There are an estimated 30,000 Haitians living illegally in the US. TPS is granted to foreigners who may not be able to return safely to their country because of a natural disaster, armed conflict or other reasons. 2228 UK International Development Secretary Douglas Alexander tells the BBC those involved in the aid operation are working against the clock. "We are acutely aware that at this stage in the crisis every hour matters - that's why we have our British firefighters on the ground already, trying to save lives. We'll be working round the clock to make sure not just that we save lives, but we tend to the needs of those who have been left devastated by this terrible earthquake." 2224 US pop star Madonna announces she will donate $250,000 to to assist Haiti's earthquake victims through the charity, Partners in Health. "My prayers are with the people of Haiti. I can't imagine the terrible pain and suffering they are experiencing," she says. 2219 The BBC's Matthew Price in Port-au-Prince says: "I have been standing outside a nursing college in the capital for several hours. One desperate woman, who is part of the management team, has told me that inside the remains of the college, which used to be five storeys high, there are 260 dead bodies and 25 people still alive, even after three days. She says the principal has received a text message from inside to that effect. A Brazilian rescue team has been trying to get access to them, but progress has been very slow. The several hundred locals gathered nearby are getting increasing alarmed." 2208The BBC's Nick Davis in Port-au-Prince says: "On one of the main roads from the airport into the city, you would expect to see convoys of trucks carrying aid. But there aren't any. A logjam at the airport caused by the logistical nightmare of the earthquake, and the poor infrastructure that existed before Tuesday, makes getting the help where it is needed almost impossible. At one cemetery nearby, bodies have been turning up all day. The hope is the urgent supplies will arrive before more die." 2202 The commander of the USS Carl Vinson, Adm Ted Branch, tells the BBC that more food supplies are expected in Haiti on Saturday as they arrive from the US military base at Guantanamo Bay. A shorter flying time has been made possible by an agreement with Cuba allowing US relief flights to use Cuban air space. "When the supplies do start to rolling in, we'll have our procedures in order, and we'll be able to more efficiently deliver the relief," he says. 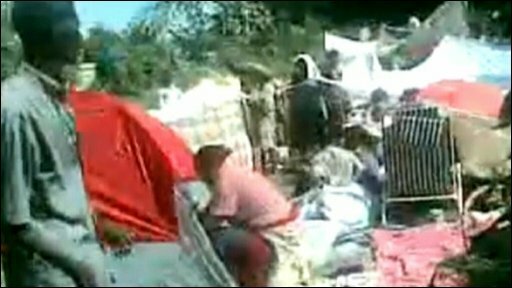 2156 Apparent delays in aid reaching survivors have prompted anger across Haiti, and there have been reports of looting. But Ian Rodgers of Save the Children says its teams in Port-au-Prince have not seen any evidence of crime. "As we move through areas, people are desperately expressing what their needs are, and calling for assistance. But the population is still at this point being very, very supportive," he tells the BBC. 2149 Mrs Clinton says they will remain at Port-au-Prince's airport during the visit and will not be using any valuable resources needed for the relief effort. She said she had been asked to come by Haiti. 2142 US Secretary of State Hillary Clinton says at a news conference that she will go to Haiti on Saturday with USAID administrator Rajiv Shah. "We will be meeting President [Rene] Preval and other members of the Haitian government along with the members of the US government team on the ground," she says. 2130 UN humanitarian chief John Holmes launches a flash appeal for $562m, saying the aid is needed for three million people affected by the earthquake for a period of six months. 2056 Reuters news agency quotes secretary of state for public safety Aramick Louis as saying the authorities have buried 40,000 bodies and believe another 100,000 probably died. 2032 Gen Douglas Fraser, the commander of US SOUTHCOM, says around 90 aid flights a day are landing at Port-au-Prince's airport. At present, there are 4,200 US military personnel in Haiti, or are involved in the relief effort, and thousands more will arrive next week, he says. In the meantime, the US is looking at the possibility of establishing a support base in the Dominican Republic, so supplies can be brought in by land, he adds. "If the citizens of Haiti will just remain in place and remain calm, help is on the way," Gen Fraser pledges. 2012 Thomas Ewald, the leader of a special US rescue unit that arrived in Haiti on Thursday, tells the Miami Herald that it is likely most of the victims will be buried in mass graves. Following lessons learned from the 2004 Asian tsunami, recovery teams will only be able to take snapshots of the dead before the bodies decay and snip pieces of clothing to show relatives. DNA sampling and medical records cannot be used in Haiti, where many people are destitute and have never received adequate medical care. 1948 The authorities in Haiti have counted 9,000 to 10,000 dead since Tuesday's earthquake, French Secretary of State for Co-operation Alain Joyandet tells the AFP news agency. The minister also says eight French citizens have been identified among the victims. 1925 Mobile phone users in the US have now contributed more than $10m to Haitian earthquake relief through text messages, which the Mobile Giving Foundation says is a record for a single cause. Its chief executive, Jim Manis, told the Reuters news agency it was receiving up to 10,000 messages a second, many donating as much as $10. 1912 Haiti's permanent representative to the UN, Leo Merores, tells the BBC that the government is able to function. "Of course, as you have seen on TV, the national palace and, as well as a number of technical ministries have been completely destroyed or severely damaged, but that doesn't mean that the government is not functioning," he says. "We can understand that the population is getting a little bit impatient but I would like to assure you that the government is doing its best to come to their assistance." 1901 The BBC's Matt Frei in Port-au-Prince says: The evidence so far suggests that Port-au-Prince is a city left to its very own meagre resources. The patients of the general hospital have spilled into the open spaces around it. Dozens of people are slowly dying while their relatives try to keep them alive with water or aspirin, or anything else they can get their hands on. Shade is their only luxury here. During our one hour visit, we saw not a single doctor or nurse. And all the time you can hear the US military helicopters overhead and aid planes landing . The airport is slowly filling up, the city needs all the help it can get and time could not be more scarce. 1858 Around a dozen US television networks will team up for an all-star telethon for Haitian earthquake relief next Friday. 1851 Dominican Republic President Leonel Fernandez met his Haitian counterpart, Rene Preval, in Port-au-Prince on Friday and pledged to help the rescue effort and re-establish communications, electricity and water supplies, the Dominican Today newspaper reports. 1838 The BBC's Matthew Price in Port-au-Prince says: "On Liberty Street, not far from the epicentre, I found people digging with their bare hands, but not for the dead. 'We're looking for drinks and food - we don't have any,' one man told me. In places, some help is beginning to appear. But elsewhere the desperation is beginning to show. Some fought as they searched for food at one supermarket. On the ground, people are just not seeing any of the aid. People are having to help themselves, getting any belongings they can out of their houses. This is a resourceful country, used to dealing with disaster, but it cannot cope alone." 1828 US Agency for International Development (USAID) administrator Rajiv Shah says there is still an important "rescue element" to the relief operation in Haiti. "Our belief is now that there is a significant urban search and rescue effort underway and it is still attempting to save lives. There is still an important open window of time today, tonight and perhaps even parts of tomorrow when we have ability to save lives; Haitian lives, American lives and the lives of partner governments and people that are there on the ground," he says. 1815 Mr Obama says he will meet former US presidents Bill Clinton and George W Bush at the White House on Saturday "to discuss how to enlist and help the American people in this recovery effort". 1813 US President Barack Obama says the scale of the devastation in Haiti is extraordinary, and it will take time to establish distribution points so food and water can be delivered safely and effectively. "I want the people of Haiti to know that we will do what it takes to save lives and to help them get back on their feet," he adds. 1809 The BBC's George Alagiah in Port-au-Prince says: "I've been out on the streets this morning and I sense a change in mood. The resignation and fear that was there in the immediate hours after the tragedy is now changing into frustration and even anger. The aid is beginning to get through, but it is not yet reaching those who need it most. So many of the injured remain untreated, and many of the dead remain unburied." 1758 European Union development ministers will hold talks in Brussels on Monday to discuss the bloc's response to the earthquake. "While we are making sure that Haiti receives the immediate and urgent support it needs, we also have to get ready for the very important next step in helping Haiti to rebuild the country," says the EU's foreign affairs chief, Lady Ashton, in a statement. 1746 UN humanitarian chief John Holmes says it will launch a flash appeal for around $560m to help victims at 2100 GMT. "Almost half of that, as is usual in these situations, will be for food, emergency food aid. And there will be amounts of between $20m and $50m for health, water and sanitation, nutrition, emergency shelter, early recovery and agriculture. Some 3 million people are believed to have been badly affected by the earthquake, and we will be looking for relief to keep them going for six months," he tells reporters. 1743 The US military has begun distributing aid in Haiti, the Associated Press reports. A rapid response unit from the U.S. Army's 82nd Airborne Division is handing out food, water and medical supplies to Haitians outside the airport in Port-au-Prince. Capt Mike Anderson says: "We're here to do as much good and as little evil as we can." 1738 The BBC World Service is broadcasting special programmes in Haiti over the weekend in French, Spanish and English. They can be heard on 11860 kHz (25 MB) and 9410 kHz (31 MB). Twitter users can also follow bbccaribbean. 1733 Paul Bertoni in Petionville e-mails: "At around 10pm last night, a neighbour of a relative we went looking for asked us if we could help him get his 13-year-old son from under the rubble. He pointed to a spot under the rubble and asked me if I could see the boy's hand. There were three little fingers in the middle of the concrete and the metal. I said I couldn't help." 1717 The UN's Chief Humanitarian Aid Co-ordinator, John Holmes, says $360m (£221m) has been pledged to help Haiti and that aid agencies are working hard to distribute supplies. "People are passing many sleepless nights trying to get this aid there," he says. 1707 The BBC's Matt Frei in Port-au-Prince says: "The streets are absolutely packed with people. Every available space in the shade - and it is about 40C (105F) in the sun - has got people living in it. Everyone else is basically on foot or on some form of transport trying to get out of town." 1705 Interpol announces it is to send a team of victim-identification experts to Haiti on Monday to help the national authorities. 1703 Barbara Gloudon writes in the Jamaica Observer: "The first question was why? Why must the people of Haiti endure such pain, over and over again?" 1701The BBC's Nick Davis in Port-au-Prince says: "The only convoys going through the streets are full of Haitians in the back of pick-up trucks and lorries, carrying what little belongings they have left. Many are leaving because the water, food and medicine they so desperately need has not reached them yet. Much of it is here, but is stuck at the airport." 1654 The Pan-American Health Organization, the Americas arm of the World Health Organization, estimates the death toll may be as high as between 50,000 and 100,000. "It's just a huge guess. I just want to be clear that we really don't know," Dr Jon Kim Andrus, deputy director of the PAHO, tells a news conference, according to the Reuters news agency. "We just don't have the information." 1643 The BBC's Andy Gallagher at Port-au-Prince airport says: "It is a very different scene from how it looks a couple of days ago. There are people here from nations across the world but overwhelmingly it is the Americans that are here in force. The search and rescue operations is well and truly underway. But the picture on the ground may be very different." 1635 Mr Ban says as many as 50% of the buildings in worst-hit areas either damaged or destroyed. "A high proportion of the 3 million people in the capital area are without access to food, water, shelter and electricity. We are still in the search-and-rescue phase, and we are trying to save as many lives as possible. A major humanitarian effort is now well under way. Although this is inevitably slow and more difficult than any of us would wish. We are mobilising all resources as fast as we possibly can," he adds. 1630 UN Secretary General Ban Ki-moon describes the search-and-rescue operation in Haiti as a "monumental" task. As for sheltering the homeless survivors, he says the UN needs "tents and more tents". 1628 Canada's Foreign Minister, Lawrence Cannon, says some 1,415 Canadians are missing in Haiti. Four are confirmed to have died. About 6,000 Canadian citizens live in Haiti, but Mr Cannon said earlier this week that only 700 were registered with the embassy in Port-au-Prince. The Globe and Mail has information on some of the victims. 1624 Roger Hilaire has posted pictures of the destruction in Pitchon Ville and Delmas on his Flickr account. 1616 UN Secretary General Ban Ki-moon says it will launch a flash appeal for $550m (£338m) later on Friday. He says logistics are "extremely difficult" in Haiti, but that the international community's response to the crisis has been "generous and robust". "We are gearing up rapidly and effectively, despite the challenging circumstances," he adds. Mr Ban plans to visit Haiti "very soon"
1612 President Preval asked Mr Obama to pass on a message to the American people: "From the bottom of my heart and on behalf of the Haitian people, thank you, thank you, thank you," he said, according to the White House. 1611 US President Barack Obama has offered his Haitian counterpart, Rene Preval, his "full support" during a telephone conversation. 1610 US Defence Secretary Robert Gates says the primary goal is to distribute aid as quickly as possible "so that people don't, in their desperation, turn to violence". He says military planners have been reluctant to drop food and water packages from the air because it could lead to rioting. At present, security is "pretty good", he adds. 1606 Dozens of US citizens are gathered at Port-au-Prince's airport, waving their passports in the hope of being evacuated, according to the Associated Press. "I don't know how much longer we can stand," says Beatrice Aristide, waiting with her 19-month-old baby. 1604 Adm Mike Mullen, the chairman of the US Joint Chiefs of Staff, says the US will have up to 10,000 troops in Haiti by Monday. 1602 Rear Adm Victor Guillery, the man overseeing the US Navy's operations in Haiti, tells the BBC that the aircraft carrier, USS Carl Vinson, will effectively act as a "sea base" outside Port-au-Prince. "Essentially, it allows for the staging of helicopters, supplies and to be responsive to the needs ashore. So, while there is a tremendous amount of effort to complete a port survey and to open a port to allow a greater amount of supplies to come across the pier to the effort, initially much of the work will be done by air," he says. The priority is to be able to set up surgical facilities that can answer to the acute needs of this population," he says. 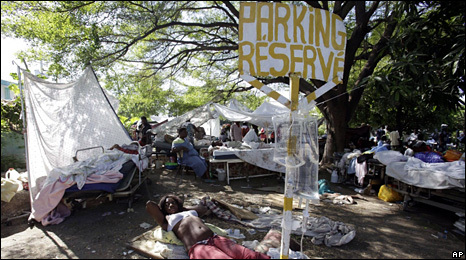 Extra medical workers have had to come in overland, because Port-au-Prince's airport is only accepting cargo planes, he adds. 1541 The BBC's Nick Davis, Port-au-Prince says: "People have been hearing on their portable radios that the international community has pledged a great deal of aid and they can see the planes landing, but they cannot get to it. They cannot get to the water, which is so vital as the days get hotter. Some people have gone three days without food or water." 1537 Andre Berto, a Haitian-American professional boxer who represented Haiti at the 2004 Olympic Games, tells the BBC World Service he is still waiting to hear news about some of his family. "It has been tough. Everyone's in a frenzy trying to find their family. I have a charitable foundation in Port-au-Prince and we disperse supplies and food, but the building has been crushed. I have the biggest fight of my life coming up, but Haiti is my life. We will continue trying to bring awareness to Haiti and let it be known that we are fighting to get this country where it needs to be," he says. 1534 The BBC's Imogen Foulkes in Geneva says: "Tonnes of aid may by heading towards Haiti but little seems to have reached those in need so far. Aid co-ordinators here say there are now enough large items such as field hospitals and search and rescue teams, but there remains an urgent need for food, clean water, doctors, nurses, medical supplies and body bags." 1531 Only a handful of stories have emerged so far of people being pulled alive from the rubble of buildings. Rescue workers say that the first 48 hours are crucial for such rescue efforts. The BBC has published an info-graphic showing how they go about their vital work. 1528 UK Prime Minister Gordon Brown says there has been an "extraordinary" response to the disaster from the British public. "We are determined to make sure that the generosity of the British people is matched by the delivery of aid to the people of Haiti," he says. 1525 A spokeswoman for the UN World Food Programme, Emilia Casella, rejects criticism from those watching the suffering in Haiti that the aid operation is too slow. "Pictures can get out instantly, and so everybody can see and hear the pictures, and that's important because the world needs to know. But getting physically tonnes and tonnes of equipment, and food, and water is not as instant as Twitter or Skype or 24-hour television news," she says. 1521 Former Cuban president Fidel Castro says Haiti's extreme poverty is "an embarrassment for our times, in a world in which most people still are victims of exploitation and abuse", according to the AFP news agency. In an editorial published by official media, he says it is "time for real and true solutions for this brother nation". 1517 The Chairman of the US Joint Chiefs of Staff, Adm Mike Mullen, says the United States is sending extra troops and marines, a hospital ship, and more helicopters to Haiti in the coming days. 1514 BBC science and technology reporter Jason Palmer has been looking at how technology and social networking sites have helped news about the earthquake spread around the world, despite the collapse of many communication systems. 1509 UN spokesman Mark Cutts tells the BBC "no-one should underestimate the difficulties of operating in a country like Haiti". "Even at the best of times, it's a difficult place to operate. It's going to be difficult, but we do have a lot of teams which have been mobilised - many of them are in the air, others are already on the ground and we are seeing this operation gear up very quickly." Solbrook tweets: "I wish the media would stop calling it looting. It's people desperate for food and water not hifis and TVs." 1503 US Defence Secretary Robert Gates tells a news conference in Washington that the relief effort in Haiti is the "highest priority for US military assets in this hemisphere". 1500 Brazilian General Jose Elito Siqueira Carvalho, a former head of UN peacekeepers in Haiti, tells the BBC World Service that co-ordination is vital due to the country's lack of infrastructure. "If you put materials there without order, this can cause more problems. All 7,000 soldiers are working hard to support the people and it's tough work. They have to have the motivation to start again. That's the history of Haiti. And they are ready to re-start," he says. Barbara Jones from Milton Keynes, UK emails: One of my family in the US has spoken to a member of my family in Haiti. She got through by chance on the phone, we had all been trying. My aunt and my cousins are OK - they are living in the street in Port-au-Prince so they won't get hurt by falling buildings. We still don't know about my mother. 1443 Former US president Bill Clinton, the UN Special Envoy for Haiti, urges Americans to make donations to help provide basic supplies for Haitians affected by the earthquake. "You've got unprecedented numbers of the people roaming the streets at night with no place to sleep. They haven't had any sleep in two days, they don't have water, they don't have food," he tells CNN. 1437 Lt Cmdr Ron Flanders, a spokesman for the US 4th Fleet in Florida, tells the BBC that the USS Carl Vinson has arrived off Haiti and begun ferrying emergency aid ashore. "We have sent two helicopters ashore into Port-au-Prince that were loaded with pallets of food and medical supplies. Those helicopters also contained the maritime commanders," he says. 1426 US journalist Andres Oppenheimer, writing in the Miami Herald, says a monitoring commission should formed right away to prevent aid "being squandered in a country with a history of massive corruption". "In a country where the state is so weak that it can't run virtually any public services and corruption is rampant, many fear that once the story fades from the headlines, the flow of international aid will diminish, and that much of what gets to Haiti will be stolen," he writes. A report last year by FRIDE, a Spain-based think tank, stated that "foreign co-operation has contributed over $2.6bn to Haiti since 1984, with little to show for it", he adds. 1413 Raymond Joseph, Haiti's ambassador to the United States, tells the BBC World Service that he is still hearing reports about strong aftershocks in his country. "I am from the south-west peninsular, from the city of Aux Cayes. The aftershock was so strong in Aux Cayes that the only hospital in the city collapsed," he says. Charles Gomila, London, UK emails: I can't believe the most powerful nation in the world cannot get aid to the people in Haiti quickly enough. No excuses, just do it! 1404 Jan Egeland, the former UN emergency relief co-ordinator, tells the BBC he believes that the situation will improve in the next 24 hours when the US military arrives. "The biggest logistical capacity on Earth is in the hands of the US military. The military will come, and I think today and tomorrow you will see great logistical change - chains being established by them. And what is good to hear is that the US government and its military will work very closely with the UN, which is also working very closely with the Red Cross." 1400 Ansel Herz, an American journalist in Port-au-Prince, tells the BBC there are children outside the UN compound who have not eaten in "one, two or three days". "I just talked to a young boy whose parents died as their house collapsed. He's out there searching, waiting for some kind of food and if anybody could give it to him. He has no money, no resources to get any aid of any kind, and that's just the case for so many children and families that are basically stranded out in Port-au-Prince. There's not a massive visible relief effort that I can see on the streets," he says. 1352 Jimmy Felter, a film-maker based in the US and founder of the charity, Voice of Haiti, tells the BBC World Service that Haiti's already poor infrastructure will hamper the rescue effort. "Haiti was hanging on by a string before this - there was starvation before this," he says. "There is no infrastructure there, so if you start trying to have an operation where everything starts pouring in it can cause much trouble and confusion. It's been too little, for too late, for too long. But the spirit of the Haitian people cannot be underestimated. I'm not giving an optimistic outlook but I would never give up hope." 1350 The UN World Food Programme earlier said its warehouses in Port-au-Prince had been looted, but this has now been denied. "We do still have that 6,000 tonnes of food," WFP spokeswoman Caroline Hurford tells the BBC. "Apparently there were unconfirmed reports of looting taking place, but once our teams got down to the dockside they were able to see that there was some mistake." 1341 Penny Lawrence of the charity, Oxfam, tells the BBC that the breakdown in communications in Haiti is causing many problems on the ground. "All of our systems rely on mobile phones, telephones, sat-phones, email, and the internet. And we are struggling very, very much without those. We understand people are getting impatient, but I do think there are extraordinary levels of devastation," she says. 1335 The BBC's Nick Davis in Port-au-Prince says: "People are doing what they can to survive. Every morning the first jobs of the day involve getting the very basics. Loaded with old plastic bottles or anything else that can hold water, they fill up where they can. Some from broken pipes from collapsed buildings, that still have a supply." 1327 Olafor Rotsson, a spokesman for the Icelandic Volunteer rescue organisation, tells the BBC power shortages and security concerns are slowing the search down at night. "When people get tired, hungry, and thirsty - and maybe lose hope - it gets more difficult. Up to now all the locals have welcomed us and we haven't had any problems at all, but the UN says 'security stage three', which means you are not allowed to work in the night." 1325 Susan Westwood, at an orphanage in Haiti, blogs: "We need powdered formula, nappies, baby wipes, baby cereal, infant Tylenol (paracetamol suspension), infant and children's vitamins, and baby care items such as lotion, powder, baby shampoo. We also hope to be able to assist the surrounding community with clothing, medical supplies, household items, hygiene items such as soap, toothbrushes, toothpaste, blankets and towels." 1323 The Disasters Emergency Committee (DEC) in the UK says it has raised £2m ($3.3m) in the first 36 hours since launching its appeal for Haiti - Queen Elizabeth II is among those to have made a donation. 1313 The New York Times has compiled an informative topographic map of Haiti highlighting the areas affected by the quake. 1304 Daniel Sergile from Amsterdam e-mails: "My cousin, Joel, was at work when his building collapsed. Initially he was reported to be safe, but it now appears that he is trapped under rubble. Two other cousins have been found safe. Phone lines are still down but we are able to communicate via satellite internet." 1257 Oxfam says ensuring access to clean water for survivors is "probably the most immediate problem to resolve now". 1249 Haiti's sea, land and air entry points have all suffered damage in the quake - as well as government and aid agency buildings - which is hampering efforts to distribute aid. 1235 Troy Livesay, a missionary working in Port-au-Prince, has taken video footage of Haitians setting up temporary camps in the city. 1231 A US Catholic charity is considering organising a mass airlift of orphaned children from Haiti, the Miami Herald reports. 1227 Anne Wilkinson, in Ilkley, UK e-mails: "I worked in Haiti for five years from 2001-2006. The latest news I have is that St Joseph's in Petionville has been destroyed but all have been evacuated. Two boys are seriously injured but have not been able to get medical attention." 1224 CNN has posted a video of a woman rescued uninjured from rubble after being trapped for 50 hours. 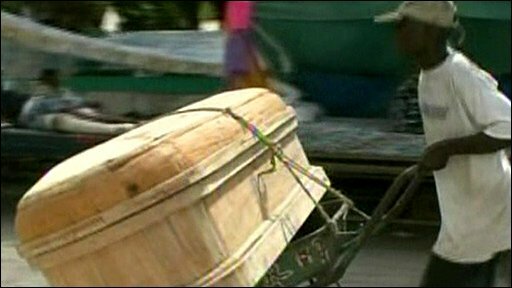 1219 The BBC's Andy Gallagher in Port-au-Prince says the dead are being buried in mass graves. "There's no time now to identify the bodies. That's something Haitians are going to have to deal with for years and years to come." 1217 The US says it has been granted rare permission to use Cuban airspace to fly aid to Haiti - AFP report. 1215 Emerson Tan, Dominican Republic, texts: "Got turned away twice from PAP [Port-au-Prince] yesterday so we're still in Dominican Republic. Sounds really chaotic on the ground with conflicting stories about landing clearances. Hopefully third time lucky. We really need to get in there to be more effective." 1212 The BBC's George Alagiah in Port-au-Prince says: "It wouldn't be the first crisis in which people resorted to what we call looting, but they are just trying find some food and water." 1209 Troylivesay tweets: "Treating water right now then out to pick up people from the embassy and start planning a clinic in our area." 1202 The BBC's Andy Gallagher in Port-au-Prince says: "People here want to talk to us and tell the world about the situation. The security situation on the ground seems fairly good, people are in as good spirits as they possibly can be. But it is now a critical situation as the hours go by, and those voices reported from inside the rubble have fallen silent." 1201 World Food Programme spokeswoman Emilia Casella says looting is "not unusual" in disaster situations and that aid distribution takes time. "Getting physically tonnes and tonnes of equipments, of food and water is not as instant as Twitter or Skype or 24-hour satellite news," AFP quotes her as saying. 1150 Anjali Kwatra of UK-based charity Action Aid, tells the BBC World Service: "In the first 48 hours after a disaster, it isn't international aid that makes a difference - that usually comes in after two or three days. It's the local people who go in, who rescue people, who provide what food, water and shelter that they can. What we're seeing in Haiti is that there isn't the ability to do that, because so many people have been affected." 1146 A spokesman for UN peacekeepers in Haiti says people are "slowly getting more angry and impatient" with the lack of aid. "We're all aware that the situation is getting more tense as the poorest people who need so much are waiting for deliveries. I think tempers might be frayed," David Wimhurst tells the Associated Press. 1141 The UN says 36 members of its staff in Haiti are confirmed to have died, while nearly 200 are still missing. 1136 Prospery Raymond, a Christian Aid staff member in Haiti tweets: "This morning I went to a pharmacy and asked for help and they gave me all their antibiotics, which I took to the hospital." 1126 US actor George Clooney is to run a telethon on MTV to raise money for victims of the Haiti quake. 1122 France has asked members of the Paris Club to write off Haiti's international debts, French Economy Minister Christine Lagarde says. 1119 Firesideint tweets: "I am starting to run - literally, run - every time an aftershock hits. Seen far too many bodies. Don't wanna add to that number." 1114 Mark Thomas, who works at an orphanage in Jacmel about 32km (20 miles) south of Port-au-Prince, tells the BBC: "We've had thousands of people killed in the city and we've had no help, there has been absolutely no aid in the city at all. We're so happy people have come to the rescue of Port-au-Prince but we have to get the message out that there are other cities." 1111 Former Haitian President Jean-Bertrand Aristide, in South Africa, says he is "ready to leave today, tomorrow, at any time, to join the people of Haiti, to share in their suffering, help rebuild the country." 1108 Singer Wyclef Jean in Haiti tweets: "Haiti needs emergency supplies right away!!! Water, Dry Goods, Blankets, and Clothing!! Pls contact state officials right now 4 drop off pts." The BBC's Mark Doyle at the airport in Port-au-Prince says: "If some planes are now arriving, it's far from clear how effective the distribution of the aid may be. There are problems of coordination with the Haitian Government, which is dysfunctional at the best of times, and some roads are reported to be blocked by buildings toppled in the quake." 1100 Steve Matthews from World Vision tells the BBC World Service: "I met a woman today clutching a picture of her husband. She was crying in the streets. There are people being carted through the streets on doors - or whatever they can use as stretchers. Everywhere you go there's something crazy that you can hardly believe you are looking at." 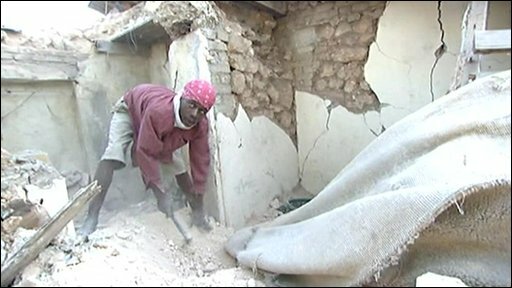 1054 BellaBaita tweets: "My brother pulled from rubble of Hotel Montana 55 hrs after quake - still hope for others." 1045 The BBC's Matthew Price in Port-au-Prince says temporary camps are springing up in the city and people are using tree branches to build shelters. "No water is being handed out"
1034 American Red Cross spokeswoman Gloria Huang tells the BBC social networking sites have helped them raise $35m (£21.5m) in the US, with $5m raised through a text message campaign alone. "The immediacy is a very strong point. This mobile texting campaign is really the centrepiece of the whole thing - it's the first time we've ever done anything like this," she says. 1031 The World Food Programme (WFP) says its warehouses in Port-au-Prince have been looted - AP reports. 1016 The International Organization for Migration (IOM) tells the BBC it needs around $30m (£18.4m) for its emergency shelter and non-food distribution in Haiti. IOM's Chief of Mission in Haiti, Vincent Houver, says access to fuel and electricity are growing concerns. 1012 Dixie Bickel, who runs an orphanage in Port-au-Prince, tells the BBC World Service: "People are leaving Port-au-Prince in masses. They've picked up what they can find, they've put it on their head and out they go. We're seeing people on the road, carrying their dead with them. They're going out in the countryside to bury them." 1005 UN spokeswoman Elisabeth Byrs says 10% of homes in Port-au-Prince have been destroyed, leaving some 300,000 people homeless. 0957 Building experts tell the BBC sub-standard housing and a lack of building regulations have contributed to the level of devastation in Haiti. "Like a house of cards"
0943 Shaul Schwarz, a TIME magazine photographer working in Haiti, tells BBC Radio 4's Today programme that angry residents near Port-au-Prince have set up a roadblock made of dead bodies, in protest over the delay in aid. 0934 Emerson Tan, an aid worker in Dominican Republic, e-mails: "Unable to land at Port-au-Prince due to overcrowding. Circled for 15 minutes before fuel forced us to head back to Dominican Republic. All air ops suspended until they can turn stuff on the ground around. We're putting pressure on the US who are running stuff on the ground. Dog teams [who need to be in first] are very annoyed." 0928 Troy Livesay tweets: "I've seen the UN and many other aid orgs stuck in traffic today - fewer visible Haitian police on the streets where I've been than usual." 0924 The BBC's Richard Lister in Washington says: "The US military mobilisation is now well under way. The air force has taken over air traffic control at the airport in Port-au-Prince, operating it around the clock. The USS Carl Vinson will be the launch pad for additional aid flights with its fleet of 19 helicopters. A US hospital ship, the Comfort, will arrive next week with 250 beds and 12 operating theatres." 0917 Harry Brown in Macau e-mails: "Just getting word - via my sister in Montreal - that 11 family members in Carrefour aged between 18 months and 60 years have survived. To what extent, we don't know yet. The relief is mixed with guilt. I am relieved to have received positive news yet there are thousands upon thousands of families hit by this tragedy." 0908 International aid charities are appealing for help for the victims. Here are some of the ways you can help. The Disasters Emergency Committee is co-ordinating donations in the UK. 0907The BBC's Andy Gallagher in Port-au-Prince says: "The aid is now trickling into the airport and some search and rescue teams are on the ground, bringing much needed help and expertise. But as the hours tick by, the bodies are piling up and the stench is now filling the air across the city. Many here have shown patience so far, but now the mood is changing."